A lot of electricians have quit their jobs too. There´s a lot of mingle-mangle on the boats and electricians as well as bigger firms are not willing to take the risks connected with refitting these boats – as cheap as possible. “Who is responsible in case something happens? The owner who wanted to save money or the electrician who installed the cheap stuff?” That makes me think some time. However, I don´t know what the situation is in England, Denmark or elsewhere where this magazine finds its readers, but my odyssey to find Thomas is quite remarkable. Hamburg, most important port of Germany and second-largest city of my country has only three yacht electricians left. So, this weekend it was my second meeting with Thomas and I was keen on listening how he was planning to do the electric refit of my King´s Cruiser 33 and took the chance to have a nice chat on this topic with him. A thorough and complete electric refit of a modern yacht with bringing everything on the latest level of current state-of-the-art: USB, Wireless, TFT-Screens, Touch and LED and all will cost as much as 25 to 30 % of the budget you did pay for the yacht initially. That´s a huge sum. Thomas says, complete refits with upgrading the boat will easily hit heights of 20.000 Euros. Well, I´m thankful I´ve found Thomas … and quite nervous too. Huge sums: “Well, you never need to go for 100 per cent. Nor do you need an upgrade to WiFi-Touchscreen-Mode. I think it´s a weighing up of necessities or musts with could-bes and would-be-nices. But nevertheless, a wrong decision can lead to disaster. Saving money at the wrong end could turn out bad.” So, do I really need a pro like Thomas … or not? 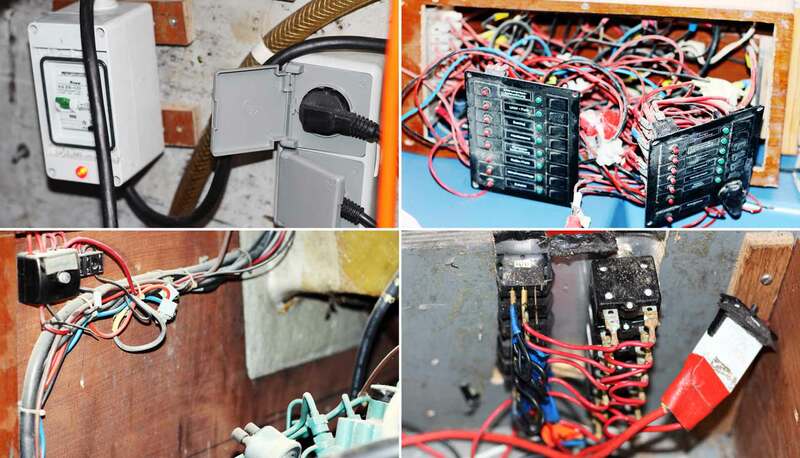 Yacht Electrics: DIY or leave it to the Pro? Electric equipment and the connected circuits are running on 12 Volt. This is low current technics and in principle there is no danger at all when being busy with wiring in DIY-mode. When asking Thomas when someone like me should better call a pro, he says: “Well, when doing the wiring at your own – which really isn´t that complicated – one should at least be familiar with things like voltage, ohm or resistance. It´s no rocket science at all. But as with anything, devil is in the detail.” I instantly know what he means, looking at some of the mingle-mangle that has been installed in my yacht over the years. Officially it is only permitted to install electric stuff in Germany when you are certified VDO-0100. 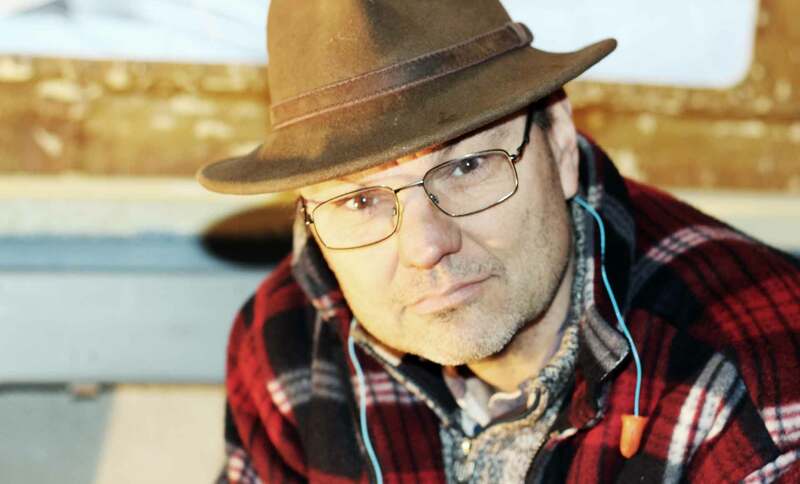 Thomas has both low-current and high-voltage certification since he is a professional electrician. “But don´t get me wrong on this one”, Thomas goes on: “Even low voltage can be very dangerous. Namely where there are high current-flows as for example with the starting motor for the engine. Usually these starters work with 80 to 100 ampere – one thousand Watts. When something goes wrong there, something is poorly wired or not safeguarded, wires can glow up, wires can get fire or set fire to whole sets of wire. And you don´t want to have a fire in the engine room!” Certainly not. Since this is our second meeting onboard SY OLIVIA I am asking Thomas how he gets a structure into a project like this: Seeing all the wires hanging from the ceiling my head aches instantly when trying to think the electric refit through: “Well, don´t panic. That is no rocket science either. First step always is a stock-taking and thorough check. We just take a look on the status quo of your ship. Second step – after you have made a decision on how many lights you want to have, which kind of radio you want to use and where to put plug sockets and stuff – it´s a thorough calculation: Summing up all current consumers and their power intake.” I understand: When we know how much energy my ship needs we are able to design the layout of the power source: The batteries. Next phase will be the work itself. It´s backbreaking and sometimes numb, as Thomas promises: “We will start by dismantling the electric installations on your ship step by step. We start with the latest added. 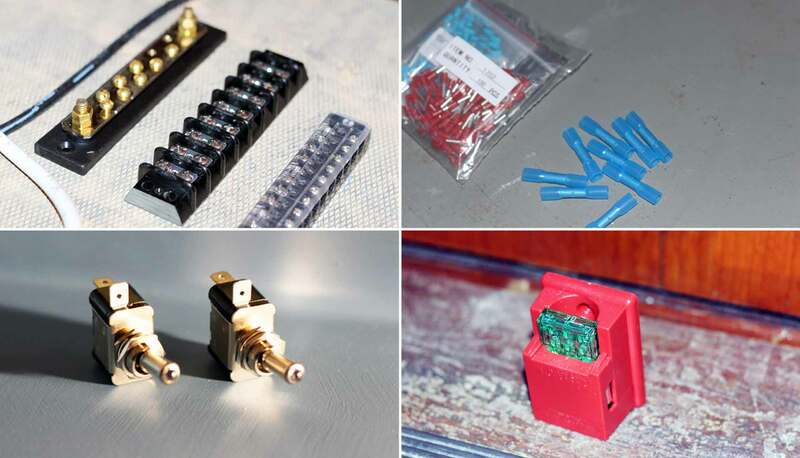 We won´t necessarily have to rip out everything given that wires are expensive and if not corroded could be re-used without problems, so during that phase we are going to gauge every single wire, every small cable in order to determine its status.” Well, that sounds like fun! Gauging current flow and resistance can give a hint whether a cable can be re-used or has to be replaced. “If you have a fixed plan of where to put what, especially in the Navigator´s place (here is an article on my initial thoughts on that one) some equipment might change its position making new wiring inevitable. Then, finally, re-wiring starts.” Mainly, he says, that´s it. Sounds like fun? I am asking Thomas of his judgement which severity refitting the King´s Cruiser has in his eyes. He thinks it over. Answered very politely: “Well. It´s an old ship. Three or four owners have laid their hands upon her and that´s a fact I can see in every corner and in every installation here. A lot of work, to be honest.” Well. Sounds not so good. And expensive. On the other hand: “From what I can see, it´s not such a big project at all. It´s a relatively small boat so wiring expands will be quite low. Secondly I have seen that the initial wiring done by the shipyard Fiskars is excellent and we should try to preserve it in its original condition.” Thomas specifies some items of the coming work: “Your ship has no main fuse. That´s a must! 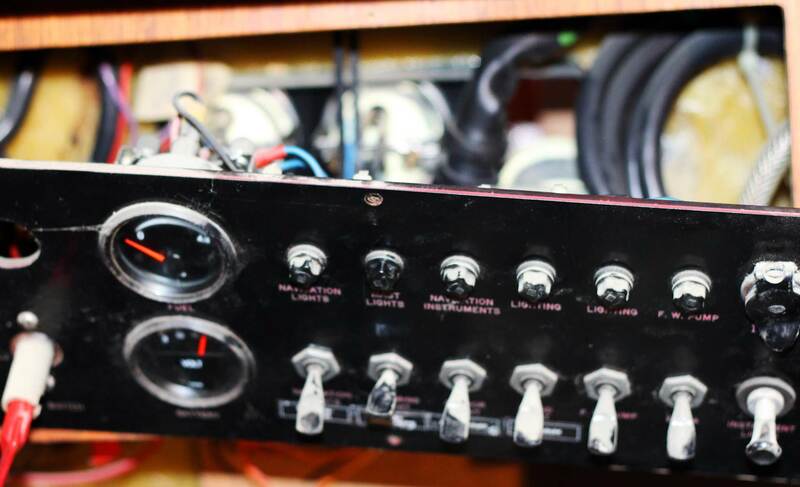 Furthermore, this boat features all kinds of different fuses anyway: From the oldest types used back in the Eighties to modern-day switch-fuses. A rethinking and standardization of the boat´s fusing-concept is the major thing to be done here.” Wiring the new lights is a no-brainer to Thomas. A big thing for Thomas are busbars. “You see, the cool thing with busbars is that you can have only one big wire with a big cross section from the battery to a place near to the consumers – let´s say the chart table. Now the busbar comes into play: Connecting the consumers with the busbar is an easy task. 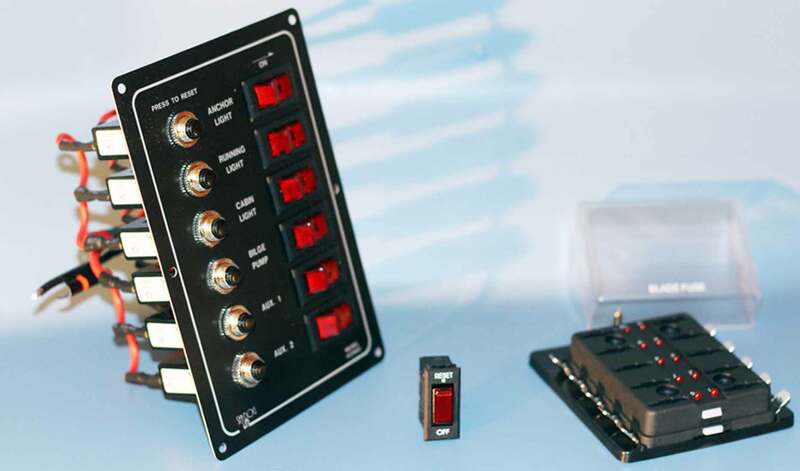 Now, in case you want to add a new part, a second chart plotter or something, you don´t have to put a wire all the way down to the battery – you just go to the busbar.” That stands to reason. Looking at my boat it occurs to me that we would need no more than four of those busbars all in all? That´s a very effective way of wiring up stuff. Thomas has a longstanding reputation of refitting yachts and a load of experience with electrical engineering as a whole. I ask him of his Top 10 failings, the most blood-curdling things he has ever had to see. “Oh my, that´s a whole evening of stories here. Let´s see. What is wrong with most yachts I have seen – as it is the fact on your boat too – is that there have been simply no fuses installed for all consumers. That´s a no go in my eyes. Which brings me to second place: If fuses have been installed, they are mostly situated at the wrong place. Fuses should be installed near the power distribution. Not where it is comfortable. The original main panel. We will try to revive it. So what´s up next? Thomas will return on my boat when I am finished with repainting the internal GRP-surfaces (here´s an article on the first step, cleaning and sanding and the second step of priming the boat) and painting them in shiny new white. Until then it is up to me to finalize the concepts both for the navigator´s place and which hardware I want to have there. I hope being able to welcome Thomas back onboard within a four-week period when the final three layers of white have been dried out thoroughly. Until then, it´s a list of a lot of items to work through – and I do look forward to meeting Thomas again back onboard SY OLIVIA. Thomas Tschechne, aka Yachtdoktor, is a certified electrician and specialized in yacht electrics and everything connected with motorcycles and cars. He has taken apart his first TV-Set at the age of 5 – when in need of a good yacht´s electrician (near Hamburg), do not hesitate to give him a call. Here´s a link to his website. Nice articles. Please add me to your newsletter and future posts. Thanks! we are currently working on the newsletter engine. until it is launched please come back and visit NFS.com regularly: we have new articles every third day. it was meant to be “in parallel”, you are right. thanks.